Hiroki Yokota is moving to a New York University from Purdue. Maybe the other University poached him so he can work on perfecting the science of LSJL in an upgraded facility. I asked him if he's performed LSJL on infant rats or on non-long bones and he says he hasn't. Infant rats would be good to perform the experiment on because infant long bones are almost completely hyaline cartilage thus enabling researchers to see how much of the benefit is based on genes upregulating due to cartilage load versus epiphyseal bone load. He also has only performed joint loading on long bones. Performing joint loading on irregular bones would enable us to see how much of a benefit the increase in interstitial fluid flow has in causing shear strain on the periosteum and endosteum. Here's a full study about LSJL. It was done slightly before the lengthening of mouse hindlimbs was done with joint loading. Joint loading increased cortical area. Now in some cases this is equal to height like the top of the head and the calcaneus. The problem is that there's no easy way to perform loading on the spine(LIPUS may be a viable option as it can generate waves through several tissues into the bone). And the vertebrae grow in a similar mechanism as to long bones despite being irregular bones. They do not have a defined epiphysis but do have large sections of trabecular bone and may have bone marrow(though vertebrae may in fact be poorly vascularized). The top and bottom and parts of the side do not have periosteum which is how appositional growth occurs thus growth from within the bone via endochondral ossification must be the way to grow taller. I am testing it on the calcaneus(heel bone) which is the most accessible irregular bone. I'm doing 1 minute 30 seconds table clamp. A foam roller might be a good way to cause a shearing force on the periosteum of the spine by rolling against the spinous process and other parts of the spine. Just causing that shearing force on that part of the periosteum may be enough to increase fluid flow throughout the entire bone including the epiphysis. Vertebral height growth predominates over intervertebral disc height growth in adolescents with scoliosis. "To determine the relative contributions of the vertebral bodies and intervertebral discs to the increase in spinal length between T5 and L5, over the age range of 7.5-20 years. The progression of spinal deformity (scoliosis) is associated with skeletal growth, but the relative roles of asymmetrical growth and remodeling of the vertebrae and discs during adolescent growth are unclear. An existing database of 406 spinal stereoradiographic studies of 188 adolescents with idiopathic scoliosis, aged between 7.5 and 20 years, was used to measure the heights of vertebral bodies and intervertebral discs, and the summation of both (spinal length). Spinal length was observed to increase from about 250 to 350 mm over this range of ages. Spinal growth was associated with an increase in vertebral height after age 10 years, with minimal if any increase in disc height. The contribution of vertebral and discal height was estimated to be about 17 and 8 mm per year, respectively, at age 7.5 years, but discal height growth was estimated to be effectively zero after age 12 years. Spinal growth of patients with scoliosis aged between 10 and 20 years occurs almost exclusively by height increases in the vertebrae, not the discs." "true values for the increase in disc heights up to age 10 years as well as the apparent continued growth of the spine at age 20 years are not certain. "<-Why does the spine continue to grow later than other bones. Analyzing such properties could lead to new height increase methods. "continued growth (about 14 mm increase in sitting height) after skeletal maturity, indicating that the spine continues to grow after cessation of limb growth." "reported continued spinal growth of about 4 mm per year for 3 years after apparent skeletal maturity. A similar rate of growth after age 17 years was observed in the present study." A segment found from the paper stated that the discs had no epiphysis. In the spine the growth plate occurs at the top of the spine in the cartilage plate. The epiphyseal ring does not apparently result in height growth. What's interesting about the spine is that some of the chondrocytes are involved in endochondral ossification whereas some contribute to the intervertebral disc. By what process does that occur? "Chondrocyte movements are herein defined as translocations of the cell body. A brief overview of cell migration in other cell types is presented to set the stage for a discussion of chondrocyte moves; this includes a discussion of the challenges that cells find when moving within tissues. Reports of isolated chondrocyte migration in vitro (isolated cell systems) and ex vivo (cartilage organ cultures) are then summarized, followed by a discussion of recent studies that infer chondrocyte movements in vivo. Investigators from different laboratories have observed chondrocyte motility in vitro[chondrocytes can move to different areas of the body]. I became interested in the question of whether articular chondrocytes retained their phenotype during their migratory excursions. We devised a simple method to separate migratory and stationary chondrocytes and then showed that migratory chondrocytes synthesized collagen II but not I--consistent with a differentiated phenotype. Our time-lapse video microscopy studies showed that the cells displayed appropriate movement kinetics, albeit with low speed and directionality. Similarly, others have presented data consistent with slow movement of chondrocytes out of cartilage explants. It is important to decipher whether these in vitro movements reflect physiological states and if so, which events are simulated. Examples of in vivo studies that have inferred chondrocyte movements include those describing rotational or gliding movements of chondrocytes in the proliferative zone of the growth plate and its importance in the growth process[so if new stem cells differentiate into chondrocytes they are likely to move into proper growth plate orientation]; and the notion that chondrocytes move from the cartilage endplates to the nucleus pulposus (NP) in the spine of rabbits and rats during development. Such studies are consistent with the hypothesis that chondrocytes exhibit highly controlled and specialized movements during tissue growth and remodeling in vivo. On the other hand, the cartilage explant studies elicit interest in the possibility that matrix injuries resulting in disruption of the collagen network of adult cartilages provide a permissive environment for chondrocyte motility." So in the LSJL histology slides for instance, if the perceived differentiation was a result of chondrocyte proliferation those cells would likely be within the plate and not outside it. "Both the extracellular matrix and the growth factor milieu provide motility signals, which the cells coordinate through associations of their signaling receptors, and by coupling of downstream intracellular effectors"<-thus why Hyaluronic Acid and Chondroitin may help increase height. "the problem of chondrocyte migration is an extremely challenging one, which requires an explanation as to how the cells could overcome the density and pressure of the surrounding matrix to migrate to other sites. "<-Maybe chondrocyte migration is just perceived and it's merely a result of a chondrocyte undergoing apoptosis in one location and being generated in another. 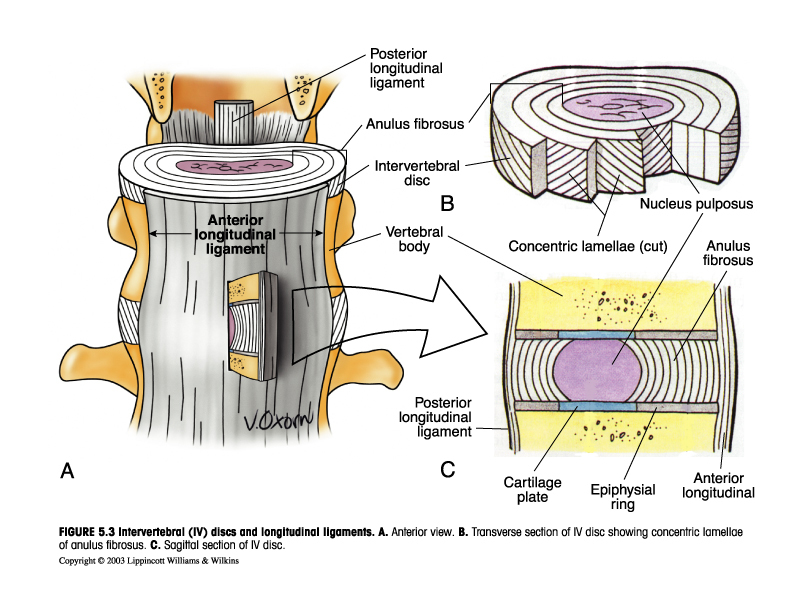 It raises the question of how the cartilagenous end plate gives rise to new intervertebral disc tissue. "positive staining in many of the cells for MT1-MMP, suggesting that this enzyme could be responsible for burrowing a trail in the matrix of the CE[cartilage endplate] to allow cell exodus and colonization of the NP[Nucleus Pulposus]. In addition, many cells expressed the Ki-67 protein marker indicative of cell proliferation and importantly, were surrounded by collagen II. The authors concluded that resting chondrocytes in the endplate are activated to migrate towards the NP." So it may be matrix degrading enzymes that allow for cartilage migration. Note that LSJL upregulates some MMP-s which may allow for such canals to be formed. Do the intervertebral endplates undergo ossification? 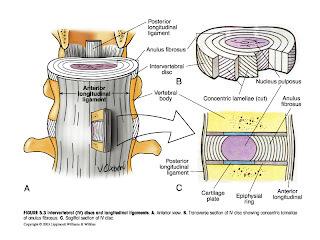 "The vertebral endplates are critical for maintaining disc function yet like other components of the disc are vulnerable to degeneration[since they are critical for function they cannot fully ossify]. Recent research suggests that the degenerative process can be retarded or reversed." 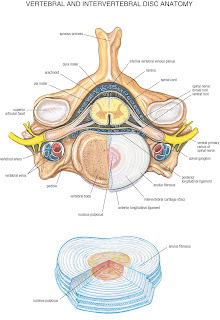 "At the cranial and caudal ends of each disc are the endplates that separate the vertebral bone from the disc itself and prevent the highly hydrated nucleus from bulging into the adjacent vertebrae. The endplates also absorb the considerable hydrostatic pressure that results from mechanical loading of the spine"<-thus no fusion as the endplates are needed to absorb hydrostatic pressure. However, how does the endplate repair itself when there is poor vascularization in the spine and thus low access to mesenchymal stem cells. 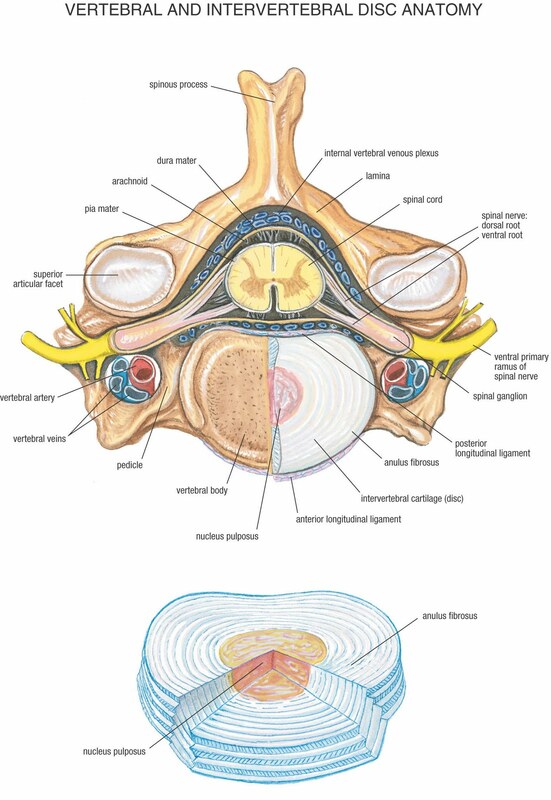 "The cartilaginous component appears to generate great interest since it persists throughout normal maturation while the adjacent vertebrae undergo ossification. It comprises a gel of hydrated proteoglycan molecules reinforced by a network of collagen fibrils. Unlike the articular cartilage of the synovial joints the collagen fibrils do not connect the endplate directly to the vertebral bone"<-the endplate likely remains as a result of the constant hydrostatic pressure the spine faces. "A network of microscopic blood vessels penetrates the endplates during development of the growing spine, principally to provide nutrition for the disc, before disappearing around the time of skeletal maturity"<-regrowing these blood vessels may be key for disc height. "Perhaps surprisingly the endplate can become revascularised after maturity in some species under normal and pathological conditions. In the latter study the revascularisation, presumed to be an attempt at tissue repair, was not able to reverse the inevitable cascade of degeneration caused by annular disruption. The creation of blood vessels in the endplate occurs by activation of the matrix degrading metalloproteinase (MMP) enzymes which are normally maintained in a latent form by tissue inhibitors"<-Thus to regrow those blood vessels it's a matter of increasing MMPs and LSJL highly upregulates MMP-3. So, even though vertebrae is poorly vascularized, it is possible to revascularize bone with the aid of MMPs. Thus LSJL should work but the physiology is slightly different than with the legs. It's hard to load the spine thus LIPUS is recommended. You'd want to target above and below the spinous process of each disc to try to form new cartilage canals and stimulate chondrogenesis from the cartilage end plate. Now the studies do say that the typical vertebral bone is undergoing constant hydrostatic pressure so why don't they grow forever? Remember, that vertebral bones do grow beyond normal time frames. It's possible that a peak level of hydrostatic pressure is reached at age 20 and thus no more further spinal height growth. And that anecdotal increases in spinal height are attributed to improvement in posture. loving the dedication man keep it up. your helping all the doomed short people, i can't imagine going through life 5'5 even tho im 17 im done growing. Is Dr Yakota aware of your experiments? What does he think of your LSJL to gain height? Could you share his thoughts? how does the stem cells travel to the hyaline cartilage? Where can they be found? The LSJL research shows that it increases growth rate for still growing rats.. what evidence is there to show it would work to stimulate new growth in fully grown adults? I can relate with anonymous #1 and a couple of questions to Tyler, would it be effective performing LSJL few times during the day or possibly overdoing it like doing it for a lot longer time? Or will it just hinder any gains and could one cause any bone problems with doing it many times a day? Annonymous #2: I don't know if H. Yokota knows about this blog. I think it's not a good idea if he does because then he could withhold information due to liability reasons. Annonymous #3: Stem cells tend to be in the trabecular bone in the epiphysis. The stem cells are released by lateral compressive force causing microfracture of this trabecular bone. The increase in interstitial fluid flow takes them to the hyaline cartilage. Annonymous #4: Rats and humans are very genetically similar although there are some differences. IIRC, Hedgehog(Indian) is one such gene that acts differently in rats and humans. Still, activity in the growth plate increased in the rats and even if rats and humans have slightly different genes physiologically they should respond the same to certain effects(like trabecular microfracture plus interstitial fluid flow). Clouds: Don't know. Just trying to see how much LSJL works, have no idea about individual eccentricities like optimal duration or number of sets. anonymous #4 is asking not so much about species differences (although that would also be important) as about efficacy of LSJL on a fully-grown adult, be it a rat or a human being. if you were to transpose the same condition from the study onto an actual human application, it would be to test LSJL on an adolescent, NOT a grown adult. given this, how can you make the conclusion just by theoretical basis that it works on humans? I can't force anyone to test LSJL on an adult human. We just have to try it on ourselves. So on the spine the sections that stick out slightly are the bits we should load by using LIPUS, what is ur personal recommendation on how long each point should be loaded for. Has there been any noticeable gain in your heel bone? I remember you saying a while back you were loading it. Khan: Right now I think it might be best to test out LIPUS on areas that don't involve organs like the tibia and femur. Then once there's proof of concept the effects on other tissue types can be studied. GhostMan: Not blatantly obvious but I think there might be some minor growth.